Co2 CYLINDER, aluminum, 5 lb, empty - F.H. Steinbart Co.
New 5 lb. 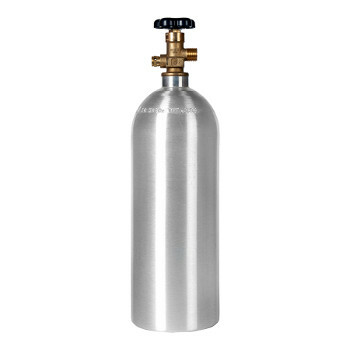 brushed aluminum CO2 cylinder – Holds 5 lbs. of liquid CO2. Ships empty. Full CO2 cylinders available for local pickup. Please call for pricing. 4-WAY AIR DISTRIBUTOR, T/R DOUBLE GAUGE REGULATOR, Co2, 0-60 p.s.i.